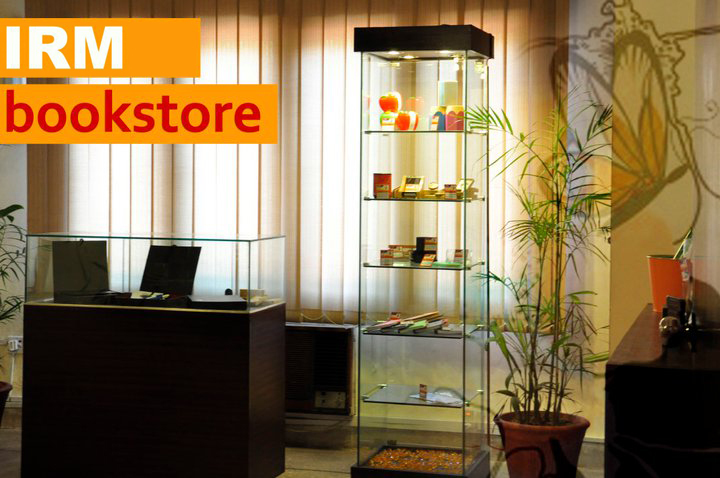 IRM Bookstore is successful and innovative venture of IRM. The mission of the IRM Bookstore is to provide a convenient and efficient source of Insignia clothing, corporate stationary, souvenirs, office supplies and other services.IRM Bookstore is making a significant contribution towards the artisans and skilled workers of the Community by providing a platform to market their products.It is offering exceptional, personalized service to the trainees, employees, external faculty, alumni and the visitors of IRM and to all the partner organizations.IRM Bookstore offers its knowledge, goods, and services in order to help foster intellectual growth, enhance the quality of life of its community and broaden the personal, educational and professional experiences of its customers.IRM Bookstore hosts numerous books on rural development, life of Shoaib Sultan Khan. IRM video archive in Bookstore hosts public dialogues of Shoaib Sultan Khan, video biography of Akhtar Hameed Khan and coverage of various HRD projects. CDs on selective HRD topics can be made on demand. Modules and manuals on selective topics are also available.Products: The bookstore has a selected range of IRM insignia clothing, corporate stationary and souvenirs; available right off the rack and through orders. It is offering services of branded stationary to all its partner organizations in the development sector.Bookstore is offering following products at very nominal rates;Green spiral note pad, White note pad, White Ball Point Pens, IRM Diaries, ID Card Holder String, IRM Calendar, IRM Corporate wrapping Sheets, Coffee Mug-Stainless Steel, Logo-Polo Shirts available in Red/Blue/Green in Men and Ladies size, T-Shirts, Dairy Jacket, Gift Box, Hand Crafted Wallets, Business Card Holder (Clear Plastic), IRM Hoodies in blue and Maroon color, Stress Release Balls, Coasters/Tea mats, Key chains, Lead Pencils, Permanent Markers etc. IRM Bookstore’s contribution to IRM Social Initiative Fund (SIF): IRM Bookstore is prime contributor to Social Initiative Fund which is launched by IRM to build the capacities of the individuals or community-based organizations that have the drive but lack opportunity. Income generated by selling products at Bookstore is directly contributed to the SIF for providing pro-bono skilled support to marginalized youth that is sustainable and offers long lasting benefits.